RANS Xstream review: Pretty fast for a slow guy. The RANS Xstream is a bike with a pedigree. Designed by one of recumbent cycling's pioneers, Randy Schlitter, the Xstream was a bicycle born, I suspect, with a single purpose: To, for once and for all, bury the myth that long wheelbase (LWB) recumbents are heavy, slow, and poor climbers. I can state with a fair degree of certainty that Mr. Schlitter achieved his objectives. Before I get into the meat of this review, however, permit me to note a few things. Though I knew of the Xstream through reputation, and had actually taken one out for a spin at Basically Bicycles prior to purchasing mine, there were few cogent reviews of this recumbent bicycle to be found on the internet. There is one review at bentrideronline.com, and a couple of "happy new buyer" notes on the cycling fora, but thorough reviews were notably absent. I feel somewhat justified in taking on the task, as I have been riding recumbents almost exclusively since the mid-1980s, and in fact, my first recumbent bicycle was the first one designed and produced by RANS -- the RANS Stratus Model A. Though I'm no racer, I commute and tour on bikes, and have been known to complete a couple of 200k randos. I pretty much live on my bikes and I do my own wrenching. So, yes, I feel very comfortable around bikes in general, and recumbent bikes in particular. My interest was drawn to the Xstream during the 2009 Ride Across America (RAAM). RAAM is a grueling, non-stop race beginning in southern California and grinding on, shedding the weak like Darwin on steroids, until the riders that are left reach Annapolis, MD. With many other recumbent bike riders, I watched with pleasure as the 4-man recumbent team, all riding the Xstream, crushed the competition and won their division by more than four hours, taking their steeds across the continent at an average speed exceeding 20 mph. Mr. Schlitter himself said that "The Xstream was designed for this race." Unsurprisingly, the RAAM win pumped sales of this bike. Oddly, though, after the initial buzz, talk about the Xstream died down considerably. Though I was favorably impressed by my brief test ride at the time, the performance of this bike was matched by the price tag, and I never could justify the expense. And so the thing sat, at least until this spring, when, with a nudge from a friend, I stumbled on a great deal from a rider who couldn't make the Xstream work for him after his back surgery. He had only ridden the bike around the block a few times, so for all intents and purposes, it was a brand-new bike at a garage sale price. I jumped at the chance. My Xstream sports a cool gray aluminum frame. Handlebar and stem were stock RANS. Up front is a RANS Apex 165mm compact double (50/34) and Ultegra derailleur. A SRAM 970 chain drives a SRAM 971 cassette (11-34) through an X-9 rear derailleur. That gives a gearing range of approx. 26-118 gear inches. On the bars are SRAM X-9 twist shifters and Avid 7 Speed Dial brake levers. Wheels are Avid XM317 (559) turning on Deore hubs. Continental Sport Contact tires complete the package. Brakes are Avid 7 Single Digit linear-pull and the cables and housings are by Alligator. The front brake is worthy of comment as brake interference with the crankset is a chronic problem with the Xstream. The front calipers are specced with KwickStop low profile pads. These allow the calipers to run in a slightly more closed position. Using a Travel Agent instead of a noodle narrowed the profile more. I was initially concerned with the gearing. For starters, I have never had a recumbent with less than triple chainrings, and I was worried that the slightly higher low end of the compact double would be insufficient for this slow old guy who lives in the foothills of the Berkshire mountain range. I was also concerned about the slightly higher bottom bracket than what I am used to. I'm at the short end of normal height, and the leg drop required by a high racer recumbent is thoroughly out of my league. With fingers crossed, I hoped I would adapt. After 300 miles on the Xstream, including the omnipresent hills as well as rolling terrain and flats, and with a couple of metric centuries under my belt, I think I have a handle on this bike. It's worthy to note that during this 300 miles, I set two personal bests, not an easy feat for a man who has been riding for 38 years. Getting the Xstream dialed in is not a task for the impatient. Seat angle affects longitudinal seat position, which in turn affects handlebar height and stem distance, as well as handlebar angle...you get the idea. That, coupled with the fact that knee interference with cornering is a very real consequence of poor setup on the Xstream had me riding with bloodied left knee and allen wrench gripped tightly in the right hand for the first 50 miles or so. Interestingly, it was at about mile 100 that I finally hit the sweet spot. I popped over a friendly New England pothole, which torqued the handlebars down ever so slightly, and voilà, it all clicked into place. I tightened up the nuts a squidge and let it be. Though the frame accommodates a wide range of heights and X-seams, I'm a touch shorter than average height. I found that to keep the handlebars correctly place for my north-of-normal seat position, I had to cut away a good 3 inches of stem. The Xstream also suffers from the RANS shifting seat clamp problem, so that the seat imperceptibly slides backwards under heavy pedal pressure until, after 30 miles or so, you realize that you are stretching a bit too much to reach the pedals. This is a well-known problem with the RANS clamp, and there are various ways to fix it -- the easiest being a piece of innertube situated between clamp and frame. Surprisingly, I found that I was very comfortable with a fairly extreme reclined position on the Hoagie seat. On my other recumbents, with more standard mesh seats, a highly reclined position makes my neck very sore after 10 or so miles. It was nice to find that the intersection of aero and comfort exists. That long wheelbase builds in a lot of suspension, so even with the fairly tight Conti tires, the Xstream runs sweetly on the chipseal and over the potholes of my riding range. Not once did I feel my teeth chattering as it has on other bikes. The LWB design also makes for very stable high-speed handling, and for the first time on a 'bent, I really felt like I was carving the curves at 60 kph. At the other end of the scale, like any other LWB, the Xstream is not a fan of low speeds. Keeping a line at 9 kph is dicey, though it can be done, and I didn't really feel that I would be easily toppled until I dropped below 7 kph. I had read about people's complaints of the Xstream's low speed handling, but frankly, this is pretty typical for a LWB. If you want to go that slow up the hills, get a trike. At any speed, though, the Xstream requires your attention. This is a thoroughbred you're riding here, not your typical stable nag, and it's not going to let you get away with sloppy handling. And there's no chance of a low-speed sharp turn. This bike is designed for the open road, not city traffic. The best way to handle the Xstream, I found, is with a combination of attention and relaxation. Actually, 38 Special put it better than I. What the Xstream gives in spades, however, is speed. This bike simply leaps at the hills, begging me with its efficient power transfer to bound up them. Once I learned to respond to the Xstream's clarion call, my concern for the lack of an extra-strength granny gear disappeared. Because, quite frankly, it won't let me go slow up the hills, and I don't need the lower gear inches. This is really the first bike that I found I could appreciably accelerate up hills. It has been a unique experience for me, passing other riders like they were standing still in the middle of a climb. More often than not, in my experience, it has been the other way around, but the Xstream puts the power to the wheel very expeditiously, even when I am deeply reclined, a position traditionally weak for climbing. The Xstream also wants its own head on the downhills. Because of the extremely aero position I can achieve, my downhill runs have increased by several kph, without me even trying. Since the bicycle feels like its running on rails, I can also corner with greater assurance, and I can lean into a curve at 57+ kph. On rolling hills this is a killer combination, allowing me to outdistance far stronger engines, because I don't even feel the hill until I'm halfway up it, and can relatively easily maintain speed over the crests. On the flats, I've found that I can maintain an average speed of 30 kph comfortably. Let's face it, that's pretty fast for a slow guy. The brakes work as you would expect from a pair of reasonable Avid V-brakes. They have more than sufficient stopping power, and I've experienced no fade on longer descents. What all of this translates into is the perfect long-distance bike. Both centuries I've ridden on the Xstream have been fast pleasures, in one case setting a long-distance personal best. I can hop on the bike with the intent of rolling for miles and not be dissatisfied. At the same time, I think I understand better the more recent silence on the part of Xstream owners. The Xstream is a demanding ride. 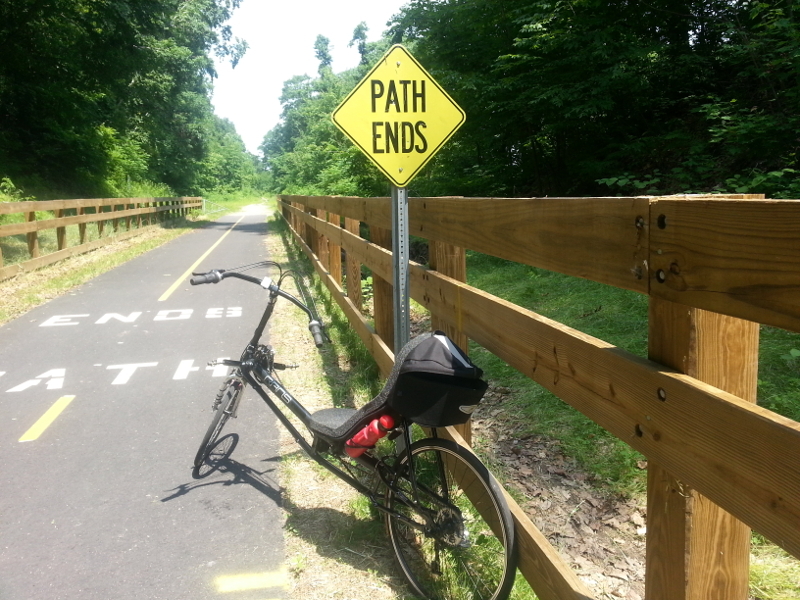 It's not a commuter, it's not an around-town bike, it's not a mosey-down-the-bike-path bike. It is a get on, go fast and go far bike, which isn't everybody's cup of tea. You aren't going to get away with napping in the saddle on an Xstream, and that makes for a lively and fun ride. Perhaps the best way I can describe it is that riding the Xstream is like riding a stallion. You have to pay attention and realize that while your steed will demand much of you, it will deliver so much more performance than any other kind of ride. For me, the Xstream filled a perfect niche in my stable. I have the all-rounder, the tourer, the utility bike and the French country bike that carries wine and baguette to the picnic. What I needed was a bike built for eating miles on the open road, a bike that challenges me to greater performance with performance of its own. The Xstream is all that and more. Note: There have been some design changes on the Xstream since my model came out. Nothing radical, but you can see the latest specs at the RANS website. Newer PostThe secret of my success: Three principles of disease. Older PostHow I protect your confidential health information.